Math and Literacy in Kindergarten pair perfectly well with one another. The best example is when you find a storybook that lends itself to an elaborate week full of wonderful activities. 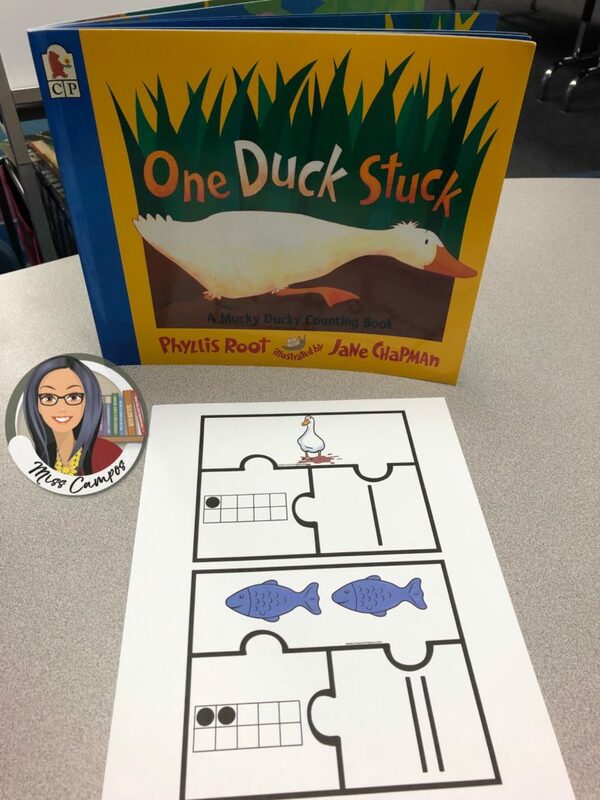 In this blog post, I will show you what I was able to do with this adorable book called, “One Duck Stuck” written by Phyllis Root and illustrated by Jane Chapman. If you do not have a copy of the book, there are some Youtube read-aloud videos available online. I purchased my copy on Amazon. I recommend having a physical copy of the text for obvious reasons. 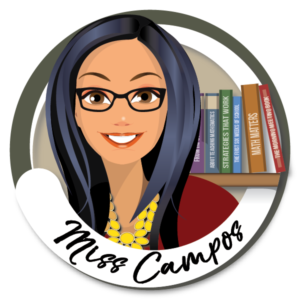 Once you have made that small purchase, I have provided a plethora of FREE activities for you to use in your classroom in both English and Spanish. Sequencing skills in Kindergarten are important for story retell. 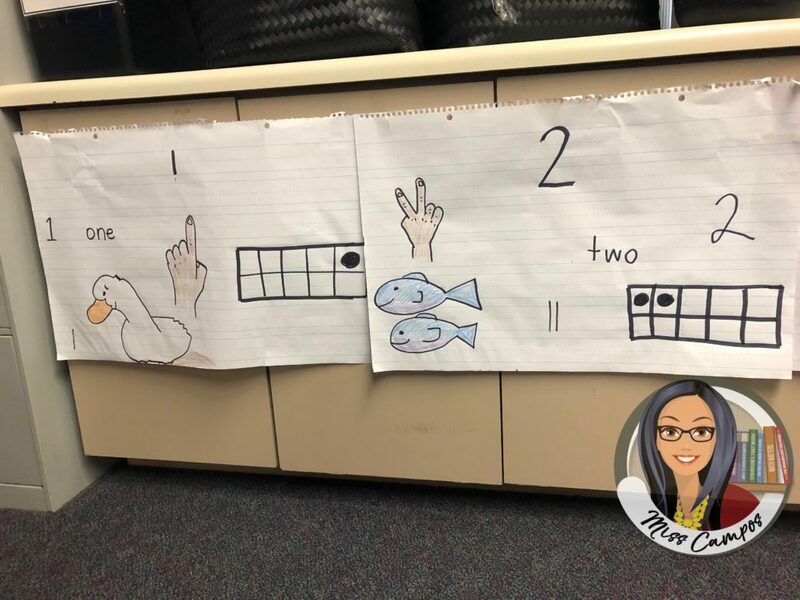 So I began by trying to get the children to memorize which animals were associated with the number one, number two, all the way to ten. 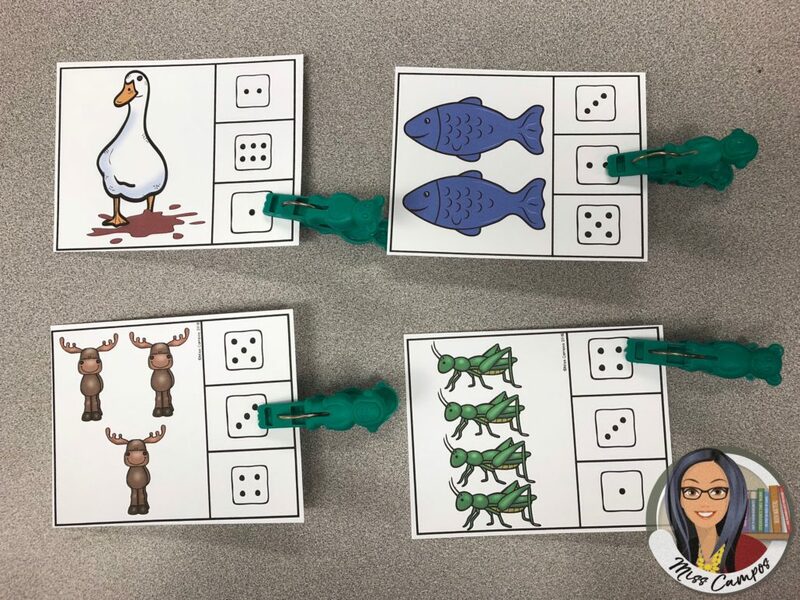 I made these puzzles to help the kids match two fish with the the symbols for the quantity of two and one duck for the symbols that represent the quantity of one. 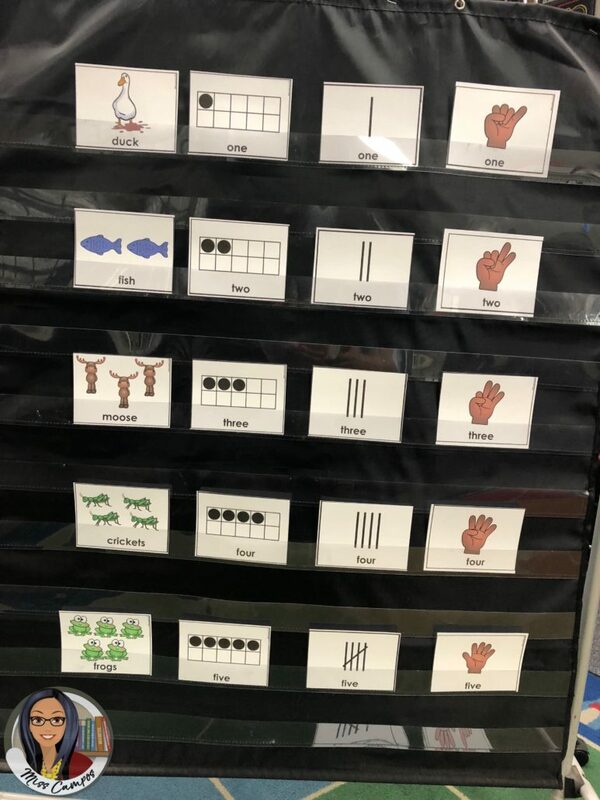 As you can see in the pictures above, I chose tally marks and ten frames as my preferred visuals to show the children. I would like the kids to visualize the quantities associated with the numbers to help them down the road when I ask them to add and subtract quantities from one another. In the picture above, I had just printed them out on card stock. I now have them laminated and cut up for the kids to put back together. 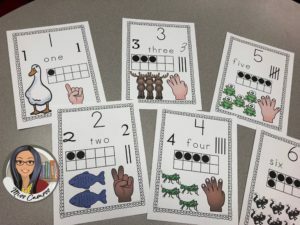 Next, I introduced these flash cards that have the book’s characters in their quantities, ten frames, tally marks, and I introduced the visual of counting fingers. Each day of this week, I reread the story or showed the class the Youtube video read-aloud at the start of our math hour. They began to memorize certain repetitive phrases from the book like, “Help! Help! Who can help?” from the little duck who was stuck. As well as “We Can! We Can!” from the animals that banned together on each page to try and save the duck. We would say them with each row on the pocket chart. These cards are also available in Spanish. I have a link to the Spanish version within the English pdf download. 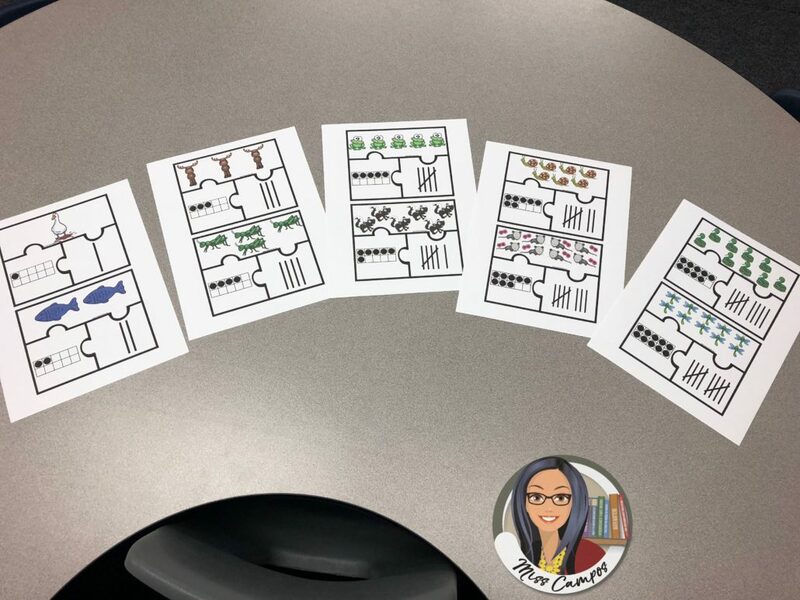 When I use the pocket chart cards with the kids, I have them order them with me and choral count and choral repeat with me. The best part is passing out the cards to the class as they sit on the rug and having them come up and RE-organize the cards back in their proper place as a whole group activity. You can even pass out the cards BEFORE reading the story one day this week. 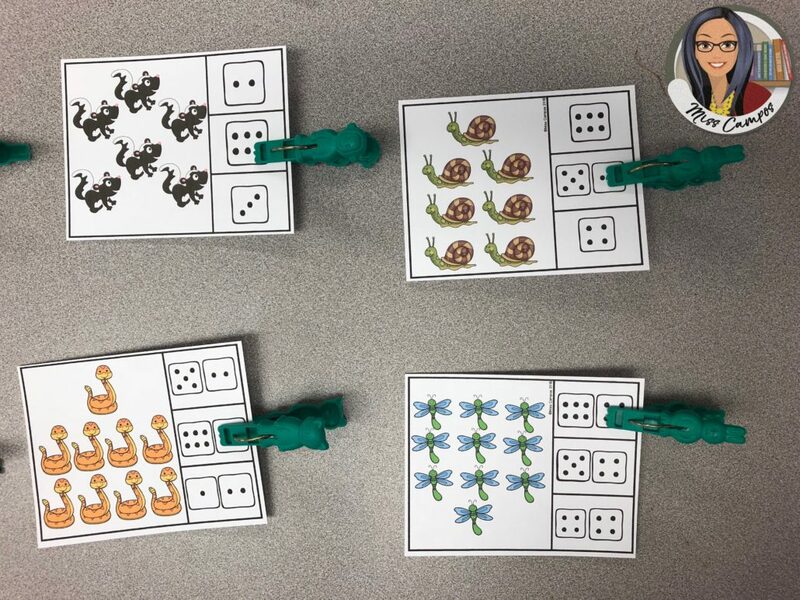 Then as you approach the page in the story that applies to a row, the kids that have those cards come up and build the pocket chart row by row. By the time you get to the page for the number seven there are seven rows built. By the time you finish the story, the kids have built the entire pocket chart as pictured above. This can later make a great math center activity as well. I also hand drew posters to represent each page and each number’s quantity. 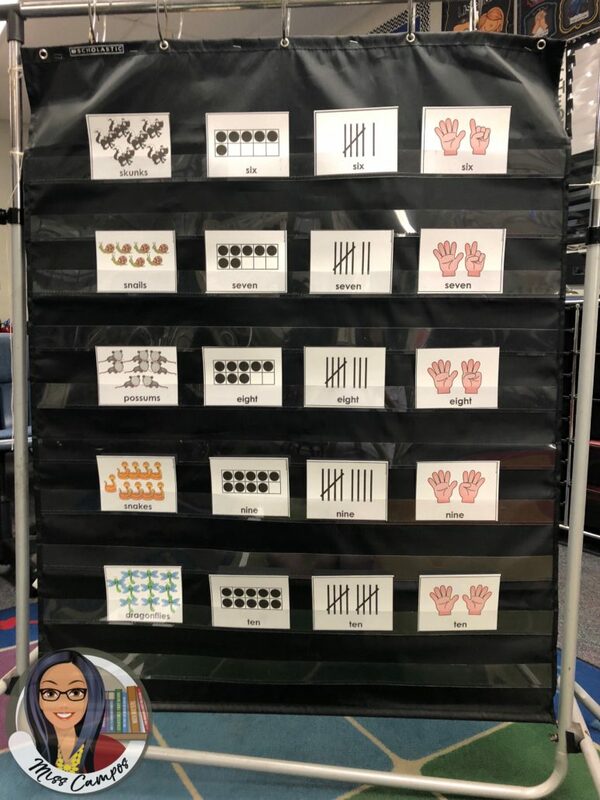 The components were simple: the number, the number’s variations, the number word, a ten frame of the number, tally marks, and I TRACED a child’s hand for each poster that allowed for the space onto each poster as the child held up the correct number of fingers. Kids loved helping me draw and color the posters’ components. However, after a few days of having these posters all around one side of my classroom, I realized they are too large and cumbersome. So I created these smaller pages as a replacement. I waited a week before replacing the big posters with the small posters. I liked the idea of having a display up all year long so these smaller sizes are more ideal for me and my preferences. If you have a lot of space in your classroom, I highly recommend keeping up the original posters the kids helped you make. The first poster represents the title of the book with the main character saying his tagline. The final two posters represent the animals banning together to save the duck and him flying away happily saying his thanks. I mounted them with velcro circles I bought on Amazon. I chose velcro, so next year, I can take them down with minimal damage to them and build the big posters with the class again before replacing them with the smaller pdf version. 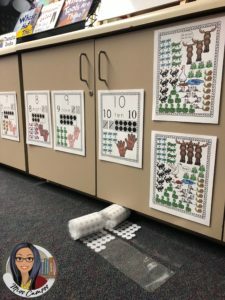 The posters are low to the ground so that kids can sit on the rug near them if they need the help with a math activity. 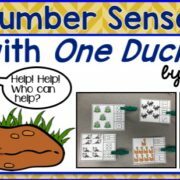 Here is the second set of free number sense puzzles I created for this book. I went ahead and added the dice dots to these puzzles despite the wall posters not including dice visuals. 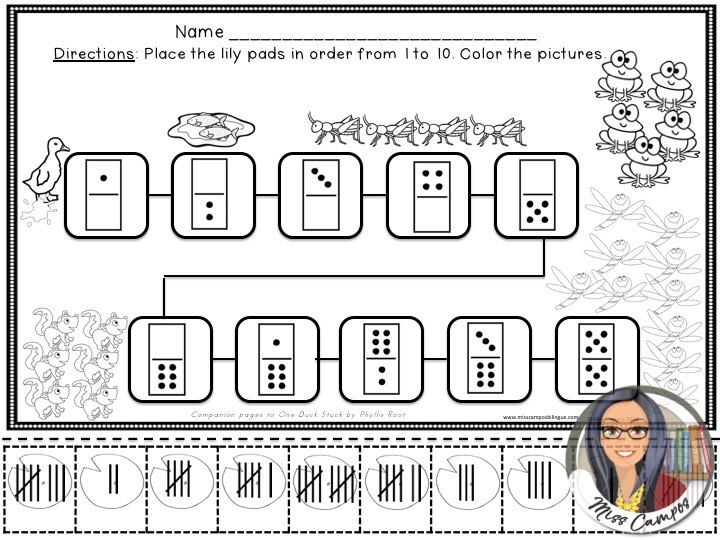 I think the kids should be able to count the dice dots and relate them to the dots on the ten frames or the tally marks. This way, they are matching quantities instead of just visually matching the exact image. The kids mark the answer with a clothespin or they can circle it with dry erase marker (if you have the puzzles laminated. I also created several free worksheets to compliment the book and the emphasis on numbers one to ten. They are available in English and Spanish. Ideal for any dual immersion school district. 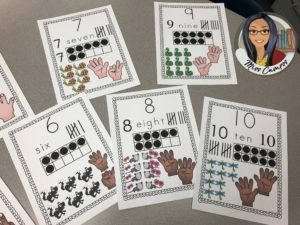 In this page, I used domino dots as well as tally marks to encourage the kids to match quantities instead of always being asked to match a quantity to a digit. 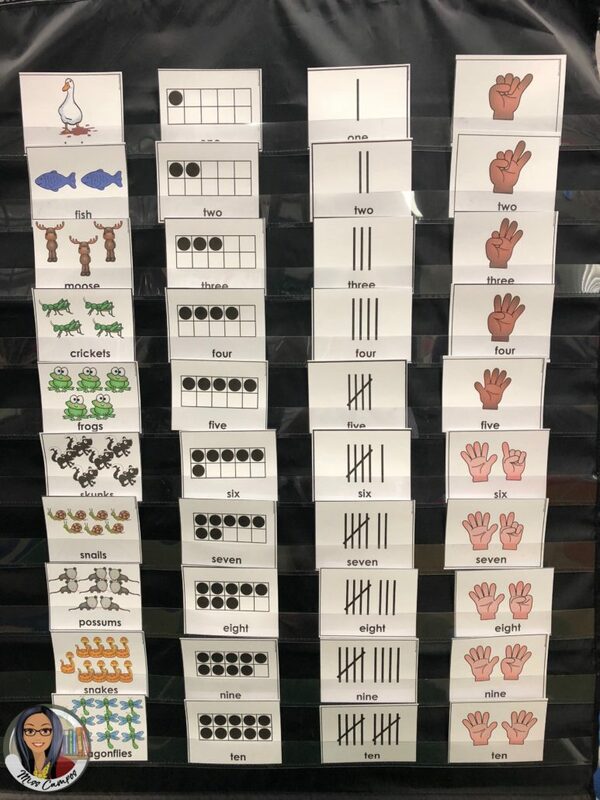 If a child needs help, they can take their page to the number posters mounted on my cabinets to try and help them figure it out. These worksheets could also be excellent Homework pages. 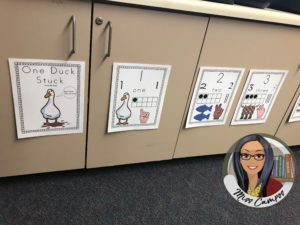 To download all of these wonderful resources click here: FREE RESOURCE LIBRARY and scroll down until you see the duck. Thank you so much for visiting my blog. Be sure to bookmark it and tell all your teacher friends or fellow homeschool parents about this post as well.